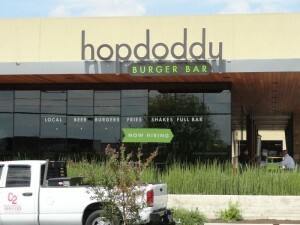 Hopdoddy Burger Bar is opening on Anderson Lane in the next couple of weeks. According to one of the employees I spoke to last week, opening day is planned for April 23, however their facebook page says by the end of the month. The gourmet burger restaurant has a location on South Congress. If you have never been there, you are in for a treat. The restaurant offers a variety burgers as well as an ahi tuna burger and a veggie burger along with a selection of craft beers and a full bar. You can find out more about the restaurant here or go to their facebook page here. The new location is on the north side of Anderson Ln in the same shopping center as Sun & Ski.